The first round of the Cleveland Browns‘ 2014 draft might go down as one of the most notorious in team history. It was here that former GM and notorious text-message savant Ray Farmer drafted cornerback Justin Gilbert and quarterback Johnny Manziel. Sure, at the time grabbing a highly-rated defensive back along with an extremely popular quarterback seemed great on paper. As we all know, though, the rate we went from raving about the selections to wondering if Farmer was drunk drafting was astounding. Enough has been written about Manziel at this point that you really only need to sum it up as succinctly as possible – Johnny got picked, Johnny got drunk, Johnny got cut. Gilbert, however, is being given a second chance this season. Despite barely touching the field last year outside of kick returns, despite numerous off-field red flags like missing meetings due to his being a “hard sleeper,” the much-maligned cornerback has been granted an opportunity to prove himself to new coach Hue Jackson. If we’re to evaluate him solely on the first week of camp, well, he’s doing poorly. Even though Cleveland is boasting a much stronger coaching staff, the same issues continue to pop up with Gilbert. At this point, everyone has likely seen the footage of rookie wideout Corey Coleman abusing Gilbert en route to an easy touchdown in camp and following it with some heated trash talk. Whether or not this was an ongoing issue finally hitting its boiling point or just Coleman letting his defender know just how much of a cakewalk the scoring play was is anyone’s guess. The crux of it all is how tough it is to not be concerned about how easily a rookie was able to shed a third-year pro. More concerning is the fact this wasn’t an exception when it comes to Gilbert’s training camp performance. He’s spent most of the practice sessions struggling in one-on-one drills, getting picked on easily by whichever wideout he’s covering. What has to be frustrating for Jackson as he watches a top-ten pick look like he’s auditioning for the practice squad is that he’s giving him such a big opportunity to earn playing time. 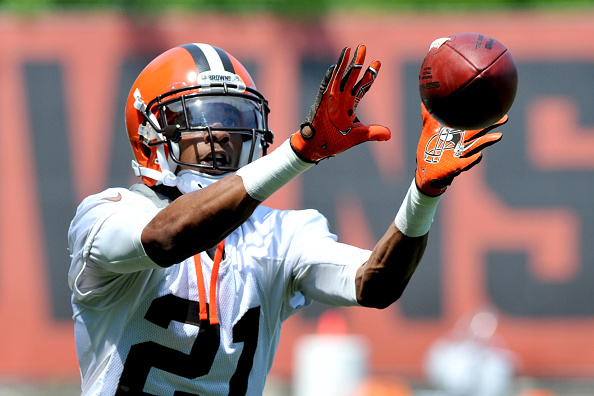 Pro Bowl corner Joe Haden is still rehabbing from ankle surgery, so Gilbert is getting plenty of reps in camp. It’s a huge chance to try and show everyone he can indeed be a reliable defensive back. Instead, Gilbert is letting everyone know he’s still miles away from being that kind of player. The hope was Jackson’s tough love and hard-nosed coaching style could light a fire under Gilbert. The knock on him for the past two years has been that he just doesn’t care enough about football, which is quite an alarming indictment. The last coaching staff tried to knock some sense into him, then appeared to just give up. However, the early returns from Jackson’s first camp aren’t much better. Intense practice sessions and increased focus on improving fundamentals aren’t having much of an effect on Gilbert. As such, despite having full two years in the pros under his belt, he’s still struggling badly with basic coverage techniques. Is Gilbert salvageable? One would hope, but evidence proves otherwise. This is a player who got scorched in his first preseason game last year, then had the gall to tell reporters he played flawlessly that night. It just seems as though he actually believes this kind of attitude is acceptable. If this new staff can’t get Gilbert to care about football – you know, his full-time job – then why bother keeping him around? Talent can only get you so far. Gilbert has not only shown that he doesn’t have much, he’s also doesn’t seem too interested enough in developing any. Unless Gilbert can make a remarkable turnaround, one which involves shedding his trademark indifference, Jackson and the Browns simply need to cut bait.